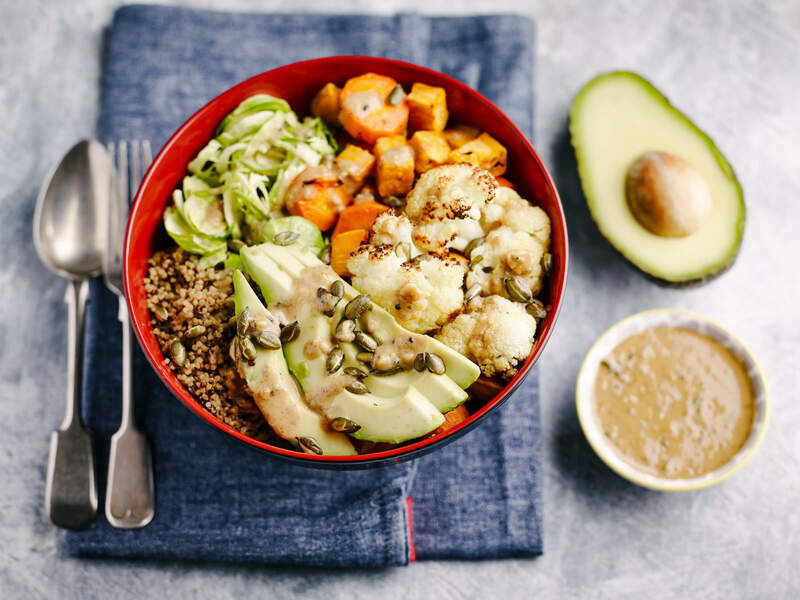 Get a delicious balance of taste, textures and nutrients with this warming Buddha bowl that will leave you feeling perfectly satisfied. Heat the oven to 200C/180C fan. Put the sweet potato, cauliflower and carrot in a large roasting tray, drizzle with the oil and season well. Roast in the hot oven for 30 minutes, shaking the tray halfway through to shuffle the veg. While the veg is cooking put the quinoa in a saucepan with double the depth of water. Bring to the boil and simmer for 10 minutes. When the quinoa is cooked drain any remaining water. Make the dressing by mixing together all of the ingredients with 3tbsp hot water until smooth. Slice the avocado, finely shred the sprouts and toast the pumpkin seeds in a dry frying pan. 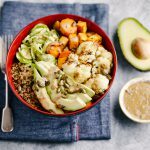 In two large deep bowls, build the dish in sections, piling the roast veg in one side then add a mound of quinoa, some slices of avocado and pile of sprouts. Scatter over the toasted seeds and drizzle with dressing.